Watch Recorders For Men And Ladies! Special Function Recorders! Combo Combo-Multifunctional Recorders With Digital Cameras And More! $1031.85 Worth Of High Quality Digital Audio Recording Gear For Only $395.00! All Your Audio Recording Needs In One BIG 4 Gear Package! 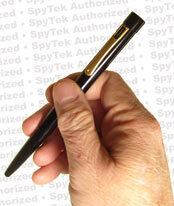 The Stealth Pen is a cut way above the run-of-the mill digital recorder pens in the market place today! It looks completely like a regular run-of-the-mill ink pen. However, when you push down the pocket clip on the pen, it starts recording. Push up the pocket clip and it stops recording. There are no lights or buttons. You can actually hand this pen to someone to sign a signed statement and they would never know there is a high quality super sensitive digital audio recorder inside the pen. This pen is thinner and gives you much higher quality recording ability that any other recorder pen in the market place. NEW! SUPER SALE! STARTING @ ONLY $89.50! Huge Discount Pricing! Starting @ $89.50! Audio Recording Reinvented for 2007! Smaller, Smarter, Better And Cheaper! "The Choice Of The Professional! " • Tiny Nano Sized Digital Recorder • Slim, Tiny And Black! • Microphone Sensitivity Adjustable (18 levels). • Time And Date Stamping! • Programmable Time And Date Recording! • Super High Quality Recording Results Every Time! If you want the world's very best digital audio recorder for investigative purposes this is it! This new generation advanced mutli-function digital audio recorder is called HotTek Advanced Audio because it's the hottest new recorder in the market place and really advanced! With the advanced features and amazing end results in recording ability, you will love both the micro tiny design and the high end results you obtain in audio evidence gathering. If you want a superior digital recorder a cut way above even the run-of-the-mill high end line, you'll find HotTek Advanced superior to anything else on the market. Voice Activation, Time And Date Stamping, So Small It's Manufactured Under A Microscope! -So Small, You Need A Magnifying Glass To Even Notice It! 18.6 Hours Recording Time! You are going to love these new tiny Micro Dot Digital Audio Recorders! There is simply nothing else like them on the market. They are just a little bigger than a US dime and will record 18.6 hours of audio. These are high end law enforcement and broadcast quality micro digital recorders built into a very small nano package. You can even obtain automatic telephone recording control specially made for them. NEW SECTION OPENS FOR 2007! InternetTeK USB Phone , MP 3 Player And Voice Recorder, Unlimited Free Ling Distance Telephone , Calls Through The Internet In the USA, And Canada for $29.95 A Year., Let Others Make Ma Bell Rich! , You Can Stick Each And Every Toll Call , Charge Right In Your Bank Account , For Only $29.95 a Year! Just Released! -High Grade- Top Quality! DEEPLY DISCOUNTED - $100.00 OR MORE OFF! CELL PHONE RECORDER AND A WHOLE LOT MORE! Only 3 1/4th inch By 1 1/8th inch By 1/2 Inch! PockeTeK is a new generation micro digital video camera, digital still camera and audio recorder you will like because of it's size with a PC card slot for expansion memory you will love. It's the world's smallest multifunctional unit of it's kind in the market and your on - the- go super evidence capture unit you can carry in your pocket! Super -High Grade- Top Quality! New Generation Digital Audio Recorders! 23 Days Of Recording Time! Get The Best And Forget The Rest! The All New Diasonic DDR-5100 Series - World's most advanced digital audio recorder, telephone recorder, MP3 Player, FM Radio recorder/player, pocket hard drive, Cell Phone Recorder! No Other Digital Tape Recorder Comes Even Close! Automatic Telephone Recording Ability. The incredibly small Micro Stick-It audio recorder produces excellent audio recording results in one of the smallest recording packages in it's class! If you just need a very tiny and simple high quality audio recorder with excellent recording results, this little gem is just the choice and on the money! With Automatic Telephone Recording Control And Cell Phone Recording Adapter! In Investigator Black Color! • Automatic Telephone Recording Control • Automatic Cell Phone Recording • External And Internal Mic • Tiny! 4 3/16 inches x 1 3/16 inches x 3/4 inch • Internal (ARS) Automatic Recording System • Long Play! 19 Hours Recording Time! New Generation For 2007! $100.00 OFF! The all new generation 133 Hour SuperTek Audio Recorder and automatic telephone recorder has features and quality found in no other recorder on the market! It's black, light weight and tiny measuring a mere 3 1/2 inches x 1 1/4 inch x 3/4th of an inch. While many telephone recorders on the market today offer long play ability, their battery life is very limited because the recorder is always draining power listening for the next call. SuperTek is very different in that it completely shuts down ALL power after three minutes until another voice is present. This feature works on regular mode as well as automatic telephone recording mode. Aside from that, Supper has what is called motion activation. This cool watch tracks the time and also stores up to 512 megabytes of your favorite music! This analog wristwatch combines an MP3 player and a voice recorder into one remarkable device! It features a USB 2.0 interface for fast and quick connection to your computer and provides over 9 hours continuous playback. A perfect complement for your active lifestyle! Just Released! High Grade Top Qulity Digital Audio Recorder! They just keep getting smaller! New Generation High-End Micro Digital Audio Recorder With The Smallest Size And Smallest Price In It's Class! Models From 17 Hours to 282 Hours Of Recording Time! NEW! PENTeK-@ Huge Discount Pricing! These new generation sharp-looking executive pens called PenTek also function as a high quality digital audio recorder in either 20 or 60 hour models. We have offered tiny audio pen recorders in the past and there is a lot of cheap ones on the market but there is NOTHING like this one! "This Innocent Looking Female Investigator Is Close Up In A Conversation With A Subject And Audio Recording Everything They Say But Only She Knows That Secret !" 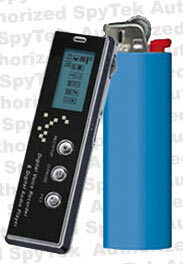 Meet a great looking covert audio recorder built into a stylish lady's watch known as the Spychic AudioTeK. Think about being able to audio record anything and everything you personally encounter. The only person who knows you are actually audio recording anything is you. (only legal in one part consent states). Aside from 9 hours of clear clear audio recording you can pick up from up to 30 feet away, you can also use this stylish lady's watch as an MP3 player. You will not miss one word of audio evidence with these on! Think about walking up to anyone outside or inside with these sunglasses on and being in a position to audio record everything they say! These are the all new MP3 covert voice recorder sun glasses with built in microphone and stereo ear phones. Stylish and functional they pack 256MB of built in memory which will allow up to 18 hours of voice recording and 8 hours of music play back. DIGITAL PEN TAPE RECORDERS JUST ENTERED A NEW DIMENSION! The All New Diasonic DDR-6000 Series - World's most advanced digital audio recorder pen , telephone recorder, MP3 Player, FM Radio recorder/player, pocket hard drive, Cell Phone Recorder! No Other Digital Pen Audio Recorder Comes Even Close! Your Computer Or Laptop Becomes Your Digital Audio Recorder! Instant Caller ID To Name And Address Data! Your Low Cost Solution To Instant Audio Telephone Recording. No Limits On Recording Time! Instantly Converts Caller ID Info To Name/Address. Time And Date Stamp On Every Recording. Powerful Software Just For Investigative Recording. NEW NANO TECHNOLOGY AT IT'S BEST! ONLY 1.5 INCHES LONG,ONE HALF INCH WIDE AND ONE FORTH INCH THICK! • So Small, It Has To Be Manufactured Under a Microscope! • When You Hold One, You'll Want To Look At It Under A Magnifying Glass! You have NEVER seen anything like this! Law enforcement grade! The size of a paper clip/push pen! You can completely palm this and wrap your hand around it. Amazing 24 hours recording time. Simple one button command1 Push to record, push to stop! Works off of tiny watch batteries (included) Comes with software and USB connection cable. If you want the world's smallest high grade broadcast quality digital audio recorder, this is it! The new generation VOICETeK VOICEPro II is the world's great recorder because of it's amazing and advanced features only found in models that cost three to five times the price! You are going to love the look, feel and recording results you obtain from this new digital recorder with it's unique VoiceTeK technology. It's SpyTeK approved! LIMITED TIME SPECIAL! HALF PRICE SALE! You Are Not Going To Believe This Until You See It! As Soon As You Review It -If You Are Like Me-You Are Going To Say, "I Got'a Have This!" This fantastic package goes why beyond the expectations of any run-of-the-mill digital recorder on the market simply because it goes why beyond the features of a boring old audio recorder! • 36 Hour Digital Recorder • MP3 Player • Movie Player With Screen MSRP: $495.00 One GB Of Memory! They say that diamonds are a girl's best friend and that holds true for lady investigators and detectives. This all new stylish 9 hour covert audio recorder built into a high grade watch has a face of cubic zirconias around it's face! Only you know the secret! Press a button and you are recording every word for up to nine hours of recording time. Not only that, You can use your new high tech stylish watch to download your music and play MP3 songs. Lady Diamond comes with all the accessories including a USB plug to download/upload to your computer and ear plugs so you or your client can listen in to the evidence you capture. The SpyTek approved VoiceTek 16 hour digital audio recorder is the professional's choice when it comes to multifunctional use such as using for interviewing and automatic telephone recording. Take a look at the advanced features includes in VoiceTeK Two Pro designed for professional investigators and law enforcement. This is a very high quality fully functional watch with built-in digital recorder/player. 256Mb flash memory records 9 full hours of voice via built-in microphone and/or dozens of MP3 music files. Ideal for recording notes on the go, dictation, or reminders. Listen to MP3 music files with included stereo earphones or on your computer using windows media player. Internal rechargeable battery records for 9 hours between charges. USB interface cable included for quick connection to your computer. The new generation SpyTek approved CLUETeK high grade digital audio recorder and automatic telephone recorder is the top choice of professional law enforcement and professional investigators because it was built just for them and gives you forensic type quality high tech recording results. Not only is ClueTek designed for the investigative and law enforcement professional, it comes with unique software that integrates with the hardware so you get top notch results on every recording. For get the law-end grab age and move up to a profession al grade audio recorder you can be proud to use. Your clients will love the results. New! Shop By Tape Recorder Category! Copyright: 2007, All rights reserved.